Noni saved her Christmas present for the last AKC trial of the year: our first Excellent Double Q! Drake took 1st place in Open Standard at the Southwestern Rottweiler Club trial in December, getting his last leg so he can move up to Excellent. Troy took 2nd in the same category winning him his first leg, only two more to go!! 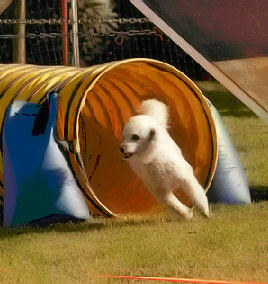 Theo has loved training and trials in early 2010. He is really starting to get the game, to work ahead of me with power and not look back. He earned his AKC Novice Standard title on Dec. 6th in Hidden Valley with a first place finish!!! 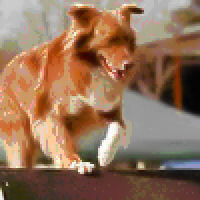 On Saturday, 12/5/09, at the GRCSD AKC Trial at HVOC, Geronimo Double Q'd! On Sunday, a knocked Standard bar kept him from a Double-Double. At the CPE Trial in November 7 & 8, hosted by Ups 'N Downs, Drake was a awesome on Saturday achieving 3 out of 5 Q's. He also was a great sport letting a junior handler, Katlin run him on Sunday even if he didn't get any Q's. Troy was a superstar earning 8 of 10 Q's. Finishing out level one with his first ever Q in Snookers, two Q's to be exact. He's an overachiever!! Racer earned 2 Q's, one in Jackpot and the other in Jumpers(his favorite class)! 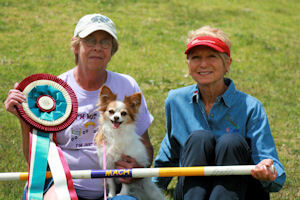 Rio got his NADAC Elite Standard Title at Rohr Park October 3rd. 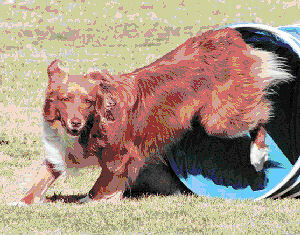 Out of 10 runs at the CPE trial in Murrieta, Oct 10-11 Rio Q'd and placed in 7. While visiting family in Sacramento, Maria Marshall and Cherokee, Meg, and Augie attended the 10 day NADAC Super Trial, September 18-27, in Elk Grove, California. We ended up with quite an xpen display of qualifying and new title ribbons. Due to the small trial size, most of the qualifying runs were 1st places, with a few 2nds. There were also other placements in runs that were not qualifiers. What a Super Trial- super fun, super hot, and super successful! Troy earned his Open Jumpers September 27, 2009 Aztec Doberman Pinscher Club of San Diego, off to excellent we go. 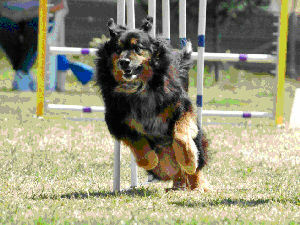 Drake earned Novice Agility September 20, 2009 at the German Shepherd Dog Club of San Diego trial, FINALLY!! 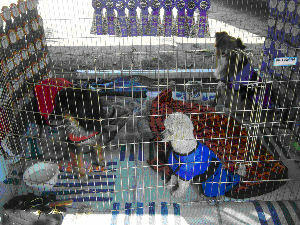 Geronimo, Hattie, Tommy and Sparky took many lst-3rd Place Q's and three titles: Hattie TG-N, Tommy NAC and Sparky NAC! Geronimo Double Q'd with 3rd and 4th Placements totaling 20 MACH points! Hattie won the X/B J/Weaves 12", 30 MACH points! On Sunday, July 26, 2009, at a hot/humid AKC Aztec Doberman Pinscher Club of San Diego trial, Geronimo (Stud Muffin) Double Q'd on very challenging courses earning 9 MACH points XBJ/W and 9 MACH 9 points (4th Place) XBStd. Geronimo was the only dog to accomplish this by layering the table near the end of the walk for a line out right over jumps to the left end of a curved tunnel! At the ACSD July 4th weekend trial in Rohr Park, Augie earned his Excellent A Standard title with a first place finish on Sunday, July 5th. He also Q'd in Ex B JWW the same day, showing that he will be capable of double Q'ing now that it will really count! 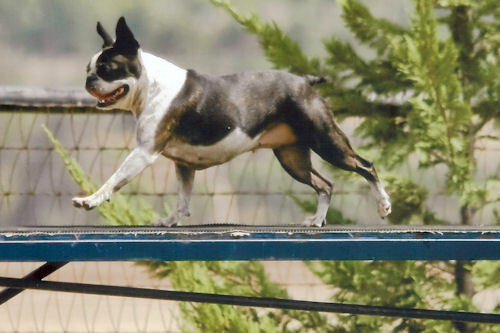 At a hot Fourth of July 2009 celebration at the Agility Club of San Diego AKC trial in Rohr Park, the Bostons and PWD attained Q's and Placements with all-star Hattie winning the 12" Excellent B Standard class for 50 MACH points. 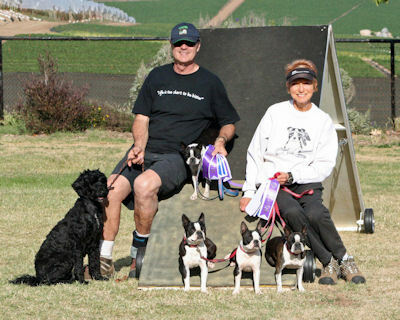 At the UDAC NADAC trial May 30 and 31, 2009, at Skydance Ranch, Oceanside, CA, the Bostons and PWD turned on their BC skills with 35 Qualifiers (17 1sts, seven 2nds, nine 3rds and two 4ths). Sparky came through for Bruce with all lsts and a TN-N title and Tommy met the challenge with two titles, WV-N and TN-N.
Sandy's Hattie came away with 1st and 2nds and two titles, WV-N and TN-N. Geronimo had 1st through 4ths and three titles, WV-N, TG-N and TN-O. Nell was a crowd pleaser attaining a few qualifiers including a 1st! 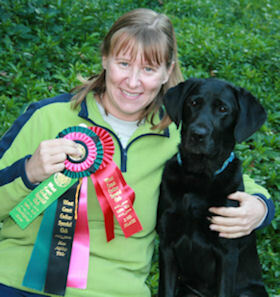 At the AKC trial on May 2 & 3, Rush got her Novice FAST title and her Open Jumpers with Weaves title. Pebbles got her MACH on May 3, 2009. 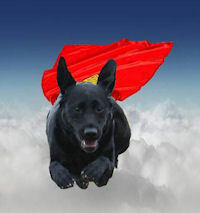 Thanks to Sandy's training she is my second Mach dog. 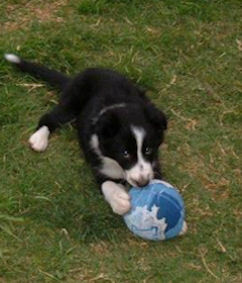 Troy was great at the CPE trial in April. He pulled off 6 Q's out of 10. The other 4 were handler error. HmmHmm 5 of his Q's were 1st place. Awesome! Drake was the MAN! At the CPE trial on April 18 and 19th, he went 10 for 10. 10 Q's leaving himself one left to finish off Level 2. Katlin and Racer entered their first CPE trial on April 18 and 19 2009. Both had a very successful weekend. Katlin earned a junior handler Q with her perfect Standard run on Sunday, even with all the pressure of family packed crowd. Racer earned 2 Qs one in Standard with a 1st place finish and one in Colors with a 2nd place finish. They are a dynamic duo!!! 7 1st and 3 2nds. Way to go! 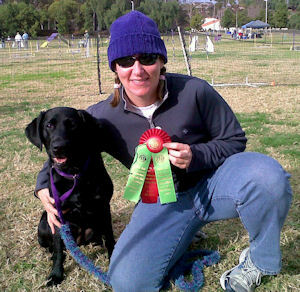 During the recent set of NADAC trials in San Diego County, Cherokee earned her Superior Novice Chances title (April 11), and then her Superior Novice Regular Agilty title (April 26). Augie earned his Outstanding Novice Jumpers title at the ACSD NADAC trial on April 26th. 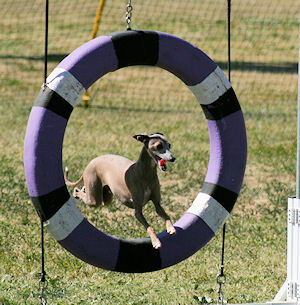 On the same day, he was the darling of the audience by clearing without any apparent effort, two 20" jumps that didn't get reset before the 12" dogs had their Novice Chances run. Meg earned a few Qs here and there during the recent set of NADAC trials, but she and mom are spending the most time working on running fast (and having more fun), and it's paying off. Meg earned a Novice Jumpers Q with a speed of 5.25 yards per second on Saturday, April 25th at the ACSD NADAC trial. On Sunday, her speed was just under 5 yps in the Jumpers event, but a knocked bar kept us from Q'ing. In celebration of Easter and return to NADAC at the FUN-raiser 4/12/09, Bruce and Sandy (quickly walking on course with her bionic left knee installed 1/26/09) brought home 1st and 2nd-Place Qualifiers! 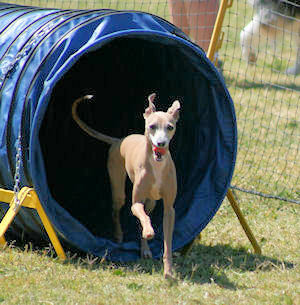 At the San Diego Agility Club AKC event at Rohr Park last weekend (March 28 & 29), Tango won 1st place in open JWW and 1st place in her first FAST event. LOVE that "send"...thanks, Sandy! 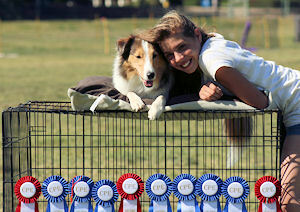 Troy earned his novice Jumpers title at the Silverbay dog show in Febraury. Two first places! My little superstar!! Drake was able to take a first place in Standard, earning his first leg in novice. 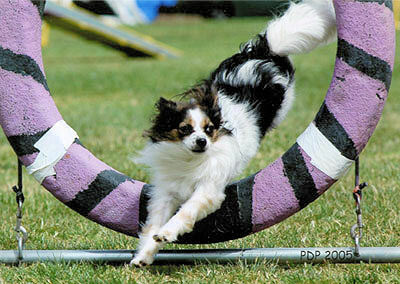 Amazingly completing a teeter in competition. Way to go Drake!!!! 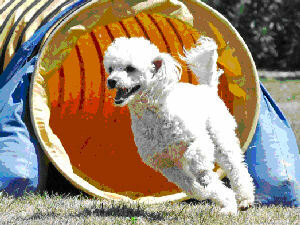 Noni struck gold at the Paws O'Robles trial in Silverado March 7-8. After a year of no FAST in San Diego, she got 1st and Q'd in Open FAST for the Open Title. The next day she got her first MACH points with a 4th and Q in JWW. Continuing the streak, she got a 2nd and Q in Excellent A Standard and now is in Excellent B Standard! Yay SUPERNONI! In Henderson, Nevada both Misty and Brandi walked away with first place finishes in Fast with Misty earning her Exc A Fast title. Misty also double Q'd with a 4th place finish in JWW. Brandi also earned a 1st place Q in Exc A Std course. 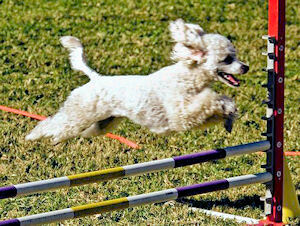 At the Portuguese Water Dog trial at Industry Hills, Misty Q'd on Sat Jan 31. She double Q'd on Sunday Feb, 1. Brandi Q'd with a 2nd place in Open STD earning the Open title. At the City of Industry Portuguese Water Dog Trial on January 31 and February 1st, Augie Q'd 3 out of 4 runs, with two 1st place runs and one 2nd place finish. 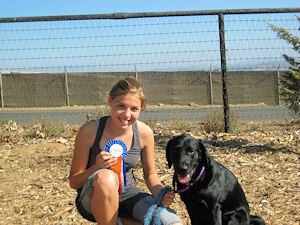 Meg double Q'd on Sunday, earning her Excellent A Standard title. 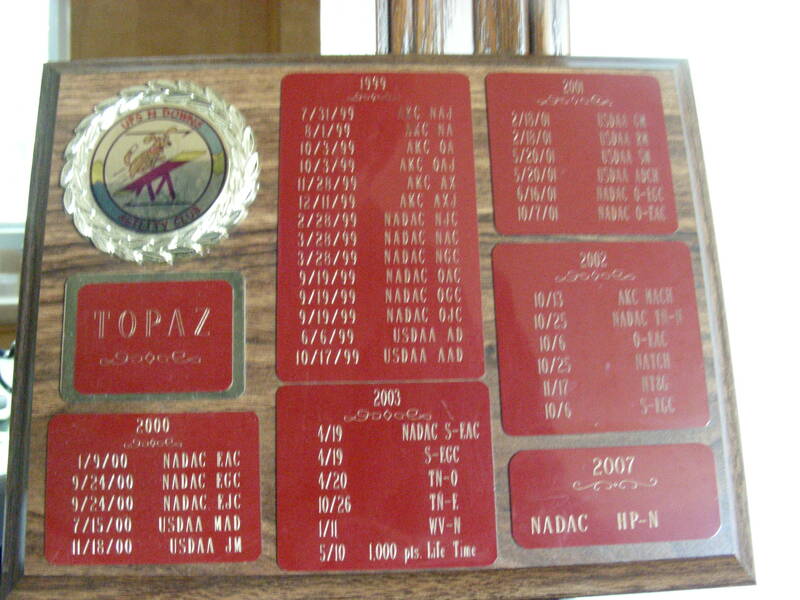 Drake earned his Novice Jumpers Title at the Southern CA Portuguese Water Dog Club Trial in the City of Industry on February 1, 2009, with a first place run. Troy earned 1st place in Standard Novice Jumpers and 2nd place in Novice Jumpers. At Arizona Wags for Wishes, January 16, 17, and 18, Meg earned two Excellent A Standard Qs, an Open FAST Q, an Excellent A JWW Q for her AXJ, and finally, an Excellent B JWW leg for her first MACH points! At the same trial, Augie earned two Open JWW Qs for his OAJ, an Open FAST Q, and two Open Standard Qs. At the USDAA Trial on Jan 9 & 10, 2009 we had a great weekend. Rush got a 4th in Starters Gamblers. The other runs were really good but no Q's. On SaturdayBam Bam was running really well, however I missed a jump. On Sunday, he got a 1st in Starters Snooker. At the West Coast Cocker Spaniel Club trial, January 1-4, Nell got her NA title on the 3rd and is in Open Standard and Open Jumpers/Weaves. All 1st and 2d Place Q's. Can you believe it? Noni is on a streak with a 2nd place Q in Excellent A Jumpers on New Years Day in City of Industry. This places her in Excellent B Jumpers...MACH points here we come!